It’s shocking that after many years of family planning promotion in Nigeria, the percentage of married women using modern contraception is only 9.8 percent (Nigeria Demographic & Health Survey 2013). That figure hardly changed from the 9.7 percent recorded five years previously. That’s lower than all countries in West Africa except Gambia, Guinea and Mauritania, according to the 2016 World Population Data Sheet. The average for all of West Africa is 13%. Clearly, family planning has stagnated in Nigeria over the last 17 years. The reasons are many but certainly family planning myths that contraceptives damage a women’s health play a huge role. Actually, the opposite is true: Contraceptives improve the health of women and children. 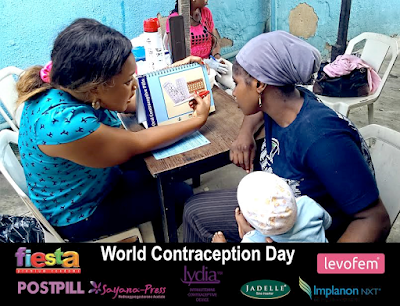 World Contraception Day on Sept. 26 provides a good opportunity to reflect on the current situation and how we can improve on it so that every Nigerian woman who wants contraception can find and access it. The good news is that 16.1% of married women in Nigeria want to use family planning but are not using it now. The figure is even higher among sexually active unmarried women: 21.8 percent of them want to use contraception. This provides us with a huge opportunity for reaching these women who are already convinced about the value of contraception and how it can help their families. Why family planning? Decades of research have shown that modest investments in family planning can save lives and improve maternal and child health. On the global stage, there is a growing effort to emphasize family planning because of the cross cutting role it plays in contributing to many, if not most, of the broader development goals. And if that is not compelling enough, consider that family planning has been proven to be one of the most cost-effective health interventions. In short, family planning improves the economic well-being of families, communities and nations. My organization, DKT International, came to Nigeria in 2012 to help change the family planning paradigm. Using social marketing, we launched Kiss and Fiesta condoms, Postpill emergency contraception, Levofem oral contraceptive, Sayana Press injectable, Implanon NXT and Jadelle implants, Lydia intrauterine devices(IUDs) and Miso-Fem (Misoprostol). After only three years, , we contributed 14% of Nigeria’s contraceptive prevalence rate in 2015. We plan to introduce other products like contraceptive vaginal rings, Caya diaphragm, hormonal IUS, post-partum IUD and various contraceptive pills in the near future so that every women finds her most suitable form of contraception most suitable form of contraception. We want to make affordable contraceptives as easily available in Nigeria as Coca-Cola. Early this month, we launched a new family planning communications campaign that coincides with World Contraception Day on Sept. 26. The target audience of our campaign is young women ages 18-34 (primary) and young men ages 20-34 (secondary) in the lower middle and working classes of southwest Nigeria. These groups are increasingly well-connected to the internet and social media, and we plan to use these technologies to reach them. This new website, http://honeyandbanana.com/,will serve as the central hub of the campaign and will be the destination for other traffic sources, such as Facebook, Twitter and Instagram. It will educate our target audiences about our products as well as other topics that interest them. But we will not rely only on digital and social media. We will also use community radio to reach rural, peri-urban and less connected young people. Like women’s beauty products or hairstyles, modern family planning should be consumer-orientedand easy to understand, access and use. It should not be a mysterious subject riddled with high-sounding but confusing terms like contraceptive prevalence rate (CPR), method mix and unmet need. When a woman wants to feel beautiful and attractive, she walks to a nearby store and buys a beauty product or service. Family planning should be obtained for the same consumer benefits — to enable women to feel beautiful by allowing them to manage their fertility and life. If we can motivate Nigerian women to adopt family planning and support the Nigerian government towards achieving the 36% CPR target for 2018, we will save the lives of many women and girls in Nigeria. Dimos Sakellaridis is the country director of DKT Nigeria, a non-profit and non-governmental organization, and has worked for many years for commercial organizations in different countries including Nigeria.